PROFESSIONALLY: Holds a career average 16.0 points, 3.7 rebounds and 3.0 assists in 247 games (213 starts)…Scored 18 points in the NBA’s first ever sanctioned game in Africa (8/1/15)...Finished second in the 2014 Foot Locker Three- Point Shootout at All-Star Weekend in New Orleans…Participated in the USA Men’s Basketball mini-camp in Las Vegas (July 2012 and 2013)…Scored 21 points in the 2014 BBVA Rising Stars Challenge…Was named to the 2012-13 NBA All Rookie First-Team and finished third in the Rookie of the Year voting…Named Eastern Conference rookie for the month in December 2012 and January 2013…Scored 12 points and had four assists in the BBVA Rising Stars Challenge at All- Star Weekend in Houston (Feb ’12)…Set the Wizards franchise rookie record with 91 three-pointers made. 2015-16: Appeared in 55 games (35 starts), averaging a 3.4 rebounds, 2.9 assists and a career-high 17.4 points…Became the first player in franchise history since Earl Monroe in 1968 to score at least 24 points in the team’s first five games…Recorded 13 games of 24+ points…Wizards went 7-3 when Beal scored 25 or more points…Shot a career-high 44.9% from the field… Had a season-high 34 points on 5-8 shooting from three vs. PHX (12/4)…Had four games with 5 three-pointers, tied for the most in his career…Hit the game-winning three as time expired to beat the Spurs 102-99 (11/4)…Missed 24 games due to injury; (three games due to a shoulder contusion (11/10-11/17); 16 games due to a stress reaction in his right fibula (12/11-1/11); 1/26 due to a broken nose and concussion; and four due to a sprained pelvis (3/8-3/12, 3/17, 4/11-4/13). 2014-15: Averaged 15.3 points (second on the team), 3.8 rebounds and 3.1 assists per game in 63 games (59 starts)...Finished ninth in the NBA in three-point field goal percentage (.409)...Scored a season-high 33 points at HOU (12/29)...Had 13 games of at least 20+ points...Recorded two double-doubles...Had two games with five three-pointers made...Scored 18 points and grabbed a season-high 11 rebounds vs. CHA (2/2)...Had the game winning layup as time expired at ORL (12/10)...Missed 18 games due to injury; nine games due to a fractured left wrist (10/29-11/19); two games due to a sore right big toe (2/7-2/9); seven games due to a mild stress reaction-lower right fibula (2/11-2/27, 3/7). Missed one game (4/15-rest). 2013-14: Averaged 17.1 points (second on the team), 3.7 rebounds, 3.3 assists per game in 73 games (73 starts)... Finished second in the 2014 Foot Locker Three-Point Shootout at All-Star Weekend in New Orleans...Scored 21 points in the 2014 BBVA Rising Stars Challenge...Finished 20th in the NBA in three-point shooting at .402 (138-343)...Recorded two games of 30+ points...Tallied 21 games of 20+ points...Had two games of at least six three-pointers made...Scored a career-high 37 points (15-of-24 from the field) at MEM (2/11)...Scored 34 points at OKC (11/10)....Hit the game-winning lay-up in Washington’s 102-101 victory over NYK at MSG (12/16)...Recorded a double-double at TOR (2/27) with 11 points and 10 rebounds...Missed nine games (11/26-12/14) due to a stress injury to his right fibula. 2012-13: Averaged 13.9 points (second on the team), 3.8 rebounds and 2.4 assists per game in 56 games (46 starts)...Finished third among all NBA rookies in scoring, second in minutes per game (31.2) fourth among all rookies in three-point field goal percentage (.386)...Tallied 13 games of 20+ points and four games of 25+ points...Had three double-doubles...Posted six games with at least four three-pointers made...Averaged 15.0 points while shooting .468 from the field and .466 from three-point range in 25 games with John Wall in the line-up...Scored a career-high 29 points and grabbed 11 rebounds vs. NYK (3/1)...Scored 26 points and nailed a career-high and Wizards rookie franchise record six three-point field goals at SAC (1/16)...Had 24 points and hit a career-high tying and rookie franchise record tying six-three pointers vs. TOR (3/31)...Recorded 22 points, five rebounds, four assists and hit the game-winning field goal vs. OKC (1/7) with 0.3 seconds left...Posted his first career double-double with 13 points and 10 rebounds vs. CHA (11/24)...Missed 26 games due to injury; two games due to a sore back (12/21-12/22); five games due to sprained right wrist (1/30-2/6); six games due to a sprained left ankle; five games due to a sprained left ankle (3/22-3/29); eight games due to a stress injury to his right fibula (4/3-4/17). 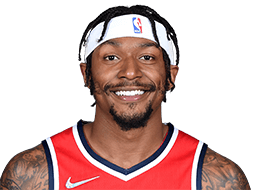 PLAYOFFS: Led the team in scoring during the 2014 NBA Playoffs at 19.2 points per game...In the Wizards’ first round victory over the Bulls became the third player in NBA history (Carmelo Anthony and Harrison Barnes) 20-or-younger to scored 25+ points in consecutive playoff games...Became the youngest player in NBA history to have three games of at least 25+ points in a single postseason...Led the team in scoring during the 2015 Playoffs at 23.4 points per game...Ranks fourth in NBA history with games of 20+ points before the age of 22 with 10....Trails Kobe Bryant (18), Tony Parker (14) and LeBron James (13). Averaged 14.8 points, 6.7 rebounds, 2.2 assists, and 1.4 steals per game in his only season at University of Florida…In addition to leading the Gators in rebounding, minutes (34.2) and steals, he led all guards in the six major conferences in rebounding…Was the first player in school history to be named First-Team All-SEC and SEC All-Freshman in the same season…Named to the NCAA West Region All-Tournament Team and All-SEC Tournament team…Was named SEC Freshman of the Week six times. PERSONALLY: Participated in the 2013 and 2014 White House Easter Egg Roll as a part of the Eggtivity Zone, joining President Barack Obama and other professional athletes in promoting health and wellness...Named the 2011 Gatorade National High School Player of the Year after his senior season in which he averaged 32.5 ppg, 5.7 rpg, 2.8 apg and 2.7 steals...A 2011 McDonald’s and Jordan Brand All-American...Scored 17 points in 21 minutes of action in the McDonald’s All American Game...Two-time Gatorade Player of the Year in Missouri (2010 and 2011)...Prior to his senior season, com¬peted for Team USA in the U17 FIBA World Championships in Germany...Led the USA squad to the gold medal earning tournament MVP honors after averaging 18.3 points per game...Averaged 29.0 points, 5.3 rebounds and 1.7 steals per game while leading Chaminade to a Class 5 district championships as a junior...Before his junior year of high school, anchored the U16 Team USA squad to a gold medal in June of 2009 at the World Championships in Mendoza, Argentina, where he averaged a team-best 19.0 points per game over the five-game schedule.